More on Soloxine dosing. . . In the days following Cheryl's posts about Hank and the soloxine dosing, I paid closer attention to my guys' routine. Hmm. In the morning Laser, Cherry and Ian were getting their 0.2 mg soloxine in ricotta cheese, dosed while their scrambled eggs cooled, and fed soon after. In the evening, they were getting it in cream cheese, before supper but not by much unless I happened to be home early enough to walk them before dinner rather than after. So, to look for preferable vehicles and alter our schedule. Peanut butter, as I posted, was problematic -- but I did figure out to minimize the amount of PB, to just a dab so they didn't struggle with the roof-of-mouth challenge; I also bought Simply JIF Creamy, which is just peanuts and a little sugar (less than in regular JIF) -- the dogs not keen on the gloppy, grainy Natural stuff I had. I considered using canned dog food but the EVO food I stock actually has more calcium per tsp (53 mg) than either cream cheese (5) or ricotta (14). So, when the yam suggestion came up I loved that, nuked a tuber, and discovered if you snip off the end you have a convenient squeeze tube. The dogs love it and if you prime them with a dab they scarf down the pill in the second dab without chewing. So now, PB in the morning and yam in the evening, and I'm managing to get the dose to them as soon as I'm either up (a.m.) or home (p.m.) to get the dose as close to an hour in advance of tummy-filling as possible. Late last week and into the weekend, Cherry was clearly agitated and miserable; the Queen of Not Here was suddenly Here, all the time, under my feet in the kitchen instead of lounging in her favorite chair, unable to settle down at night and instead repeatedly circling, flopping down, circling, flopping, digging, etc, leading to me banishing her (with company) to the dog room. The third night of this, after I sent her out thinking she had business to take care of, I thoroughly panicked myself by Googling +dog and +restless, and reading Restlessness is One of Ten Symptoms You Must Never Ignore in a Dog, because it could mean they have bloat, pseudorabies, etc. She was scratching her ears like crazy, but since the symptoms were a few days old at that point I ruled out pseudorabies. On to a more reputable source, I logged on to IVIS and searched restlessness, and hypERthyroidism came up close to the top of the list. When Cherry came in I had a long look at her and noticed her eyes definitely were bulging a bit -- I had observed that earlier in the day but it didn't resonate then. It did now. NOW she is getting too much soloxine. Maybe Laser is too? Closer attention showed he was just a bit more restless than previously, but don't hate me for admitting, annoyingly so for his age! The next day I gave Cherry a whole 0.2 in the morning, and only half of one in the evening. She slept through the night. Correspondence with Dr Dodds: I wanted to know if I had to have levels measured before I reduced the dose. No, she said, just reduce it and then after 6 - 8 weeks see if the levels are still adequate. I expressed concern my vet would want to see "before" tests before they would prescribe the lower dose, and Jean's response was that I could cut the 0.2 with cuticle scissors! Well, it works somewhat imperfectly but one way or another the two senior dogs are now each getting a total of 0.3 mg/day, in approximate 0.15 mg doses. Ian has no obvious changes on the 0.2 though I'm watching him closely. And I swear Laser can hear me better now! This afternoon I shared a copy of my recent post on Gracie's new T4 readings with Dr. Jean Dodds. She was delighted to know that the administration method had yielded good results but she offered the very important following information that was clearly news to me. She has given me permission to share it, so I am quoting her directly. 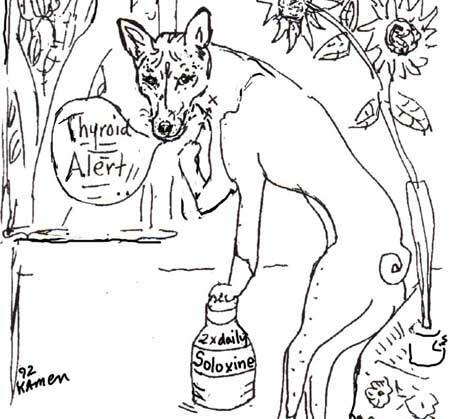 "FYI – the thyroxine dose is not linear for dogs, the spectrum weighing from very little to very large, and goes from a higher dose need for puppies and adolescents (e.g. 0. 1 mg per 10 lbs )to the adult dose (0.1 mg per 12 [smaller dogs]-15 [larger dogs] lbs) a lower dose for geriatrics (0.1 mg per 15 lbs). This translates to my advice about your older dog, Gracie. At her age (13 yrs) and current weight (about 55 lbs) , the dose of Soloxine you’re planning to give is still too high. I suggest a maximum of 0. 4 mg twice daily. "